‘Where would you boldly go next’ COMPETITION! We’re super excited about the launch of the first ever fully interactive Star Trek Fact and Fiction Navigraphic and to celebrate we’ve decided to give you the chance to WIN an unbelievable Star Trek prize bundle plus loads more prizes! To enter simply choose one of the following Star Trek locations and tell us why you’d like to go there in the Facebook comment box at the bottom of the page… EASY! 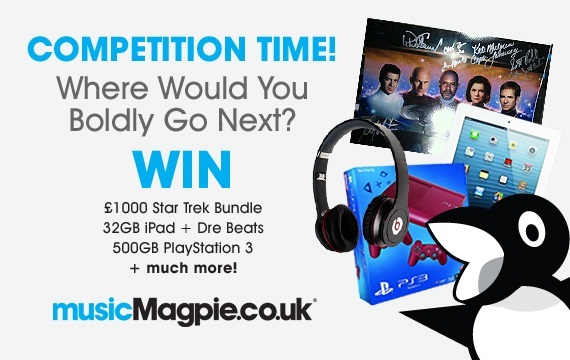 3rd Prize bundle: PlayStation 3 500GB Slimline Red, Star Trek Twin Controller PS3 Charger +Star Trek PS3 Game! The answer that receives the most Facebook likes wins… simple! So share your answer with all your friends by selecting ‘post on Facebook’ and if they agree with where you would boldly go next, then you could be a lucky winner of one these amazing prize bundles! Please submit your entry in the Facebook comment box at the bottom of this page or head over to the Star Trek Navigraphic and enter there! Winners will be announced following the competition closing date on Monday 5th August. Good Luck!